Protecting our electronic equipment can be sometimes very tricky and many companies have made a good fortune out of this potential accidents by giving you insurances and accidental coverages, one of the major problem creators for your gadgets is water. 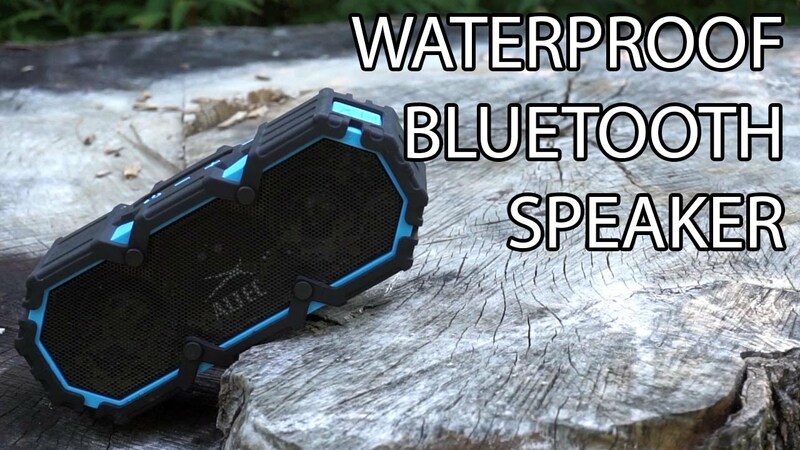 So in this article, we are giving you the names and features of some of the best waterproof Bluetooth speakers, which gives you the best value for money. 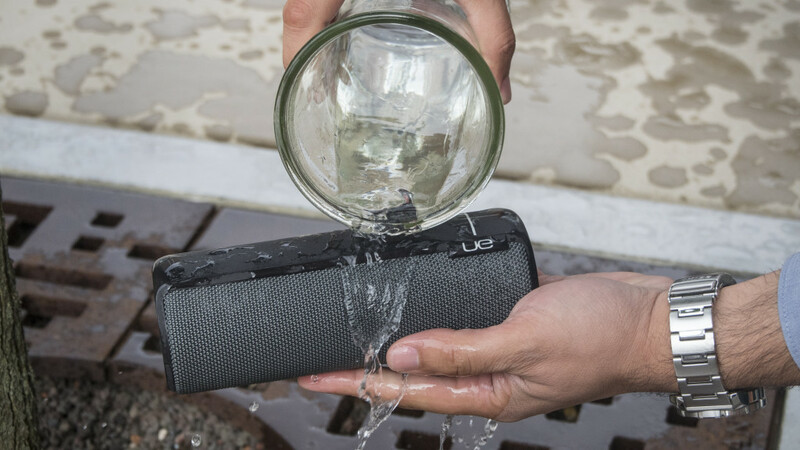 Our first choice for the best waterproof Bluetooth speaker came out to be the UE BOOM 2 Phantom – It comes in an affordable price range also gives you the advantage of dust and shock resistance, and of course, offers great audio quality. However, we also find the 10 best Bluetooth marine speakers on the market today in case you wanted some more options to decide for yourself. How to select the best waterproof Bluetooth speaker? We have seen some popular waterproof Bluetooth speakers for less than $ 100 and even less than $ 50; however, with more spending, you are bound to get more quality speakers. It is relatively important to consider how and where you plan to use your waterproof speaker. How about the shower? You will not need something too powerful and you can probably escape with a cheaper model. Are you going to make a weekend trip? Grab a speaker with a lot of playing time, especially if it’s not going to be a power source to recharge the speaker. Many of these Bluetooth speakers are not only waterproof but come with some other protection, as well as dust, dirt, shock and much more. Is this important to you? What about built-in microphones for hands-free calls, controls on the unit itself, LED light notifications, and more? We list the highlights of each speaker. We know those aesthetics are important. Many of these (and a little like headphones) are merely available only in black. However, there are enough out there available in different colors. We put this last in case – we know a few who want a specific color and care of the appearance of their speaker. EU BOOM 2 Phantom as stated above, is our # 1 choice when it comes to the best waterproof wireless Bluetooth speaker on the market today. Together with necessary water protection, it is also shock and dirt proof, which means that you can take it to literally any environments with confidence. If you are looking for an even more dramatic effect, it is possible to connect two UE BOOM 2 Phantom speakers together and experience even more power and stereo sound quality while on the move. The Bluetooth connectivity of this model will allow you to connect from 100 feet away, which means you can listen to your favorite music while on the beach, at a pool party, when hiking or camping, etc. Equipped with a rechargeable lithium-ion battery that lasts about 15 hours (longer than most of this guide). The UE BOOM 2 Phantom is one of the best waterproof Bluetooth speaker models due to its technical capabilities and the quality of its overall stability and construction. Sharkk Mako, equipped with its own phrase and exclusive MaxxBass advanced technology and waterproof capability with dust and shockproof protection (rated IP67), this is another top selection to consider, especially if you felt the previous speaker was a bit too expensive. With its robust design and its protection against the elements and the surrounding elements, you can enjoy the clear sound of your favorite songs while you are away. It is added with 4.0.Bluetooth connection, NFC function, and the AUX port (in case the connection is blurred) which allows you to easily connect to mobile devices with several options, while the built-in microphone gives you the ability to answer hands-free calls as all right. The Sharkk Mako allows the use of S-Voice and Siri applications and is equipped with a charge status indicator, a LED button backlight, and an LED power supply for convenient use in different situations and conditions. The 4400 mAh battery will allow approximately 12 hours to listen to music non-stop, no matter where you go. 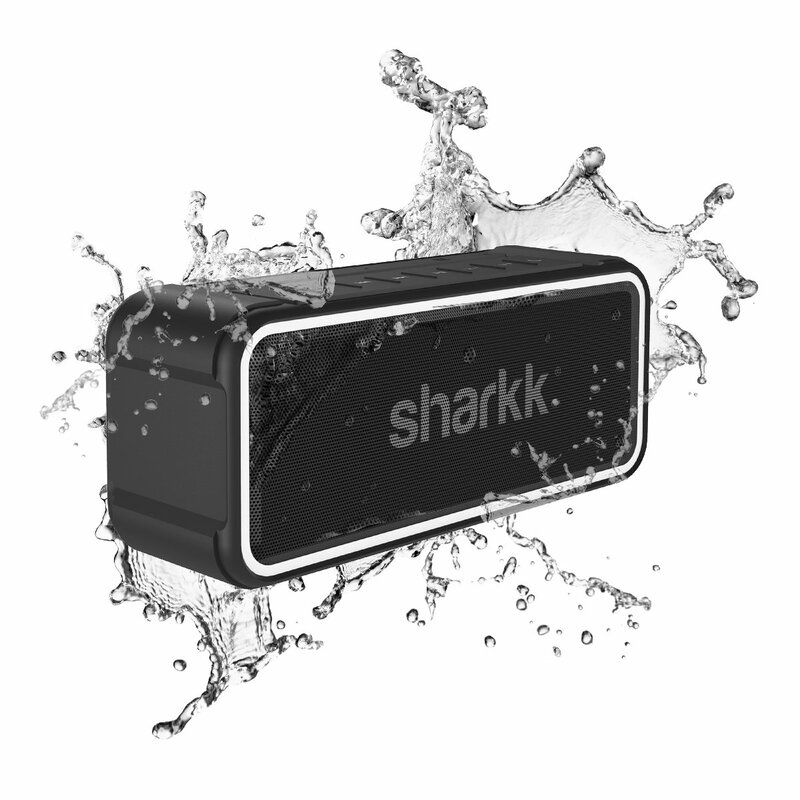 So for an affordable price, the Sharkk Mako is definitely one of the best waterproof Bluetooth speaker options on the market these days. VicTsing VS1-PA57D Packed in an elegant body with waterproof silicone and a cool interface design, the VicTsing VS1-PA57D will work reliably in most of the weather conditions and situations, it is also dustproof and shockproof. When it comes to the pricing, this is super economical, so it will not only be perfect for those who need a smaller size waterproof speaker but an easy cost model. Thanks to the Bluetooth connection, you can connect the speaker to different online sources and obtain an incredible sound of stereo quality. Its built-in microphone allows you to comfortably answer phone calls with your voice, hands-free. 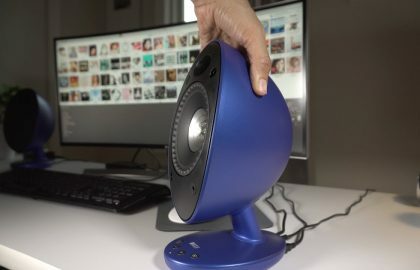 It is equipped with a rechargeable lithium-ion battery that lasts about 6 hours before it has to be recharged again, so it’s not necessarily the most durable speaker out there, but considering the size and the price, it’s expected to be a bit less in this regard. If you are looking for the best waterproof Bluetooth speaker with a super compact size that works reliably and provide decent sound quality considering the price, then the VicTsing VS1-PA57D is definitely a good choice. If you are ready to pay for it then you will have a speaker with which you can play throwing this thing back and forth with a friend – it’s extremely tough and recommended for those in extreme environments. This is an excellent choice if you want to experience the clear and powerful sound of your favorite music while you feel confident in its rigidity. The life jacket 2 is equipped with a rechargeable lithium-ion battery that will give you about 16 hours of listening before it needs to be charged again. Since construction is an obvious highlight, the combination of a relatively durable battery also helps for day trips or weekends. Further, this handy waterproof Bluetooth speaker comes with some other convenient features, such as voice confirmation and a hands-free answer microphone for phone calls. There is also (we love it) a power bank capability for remote charging of your smartphone while you are away. 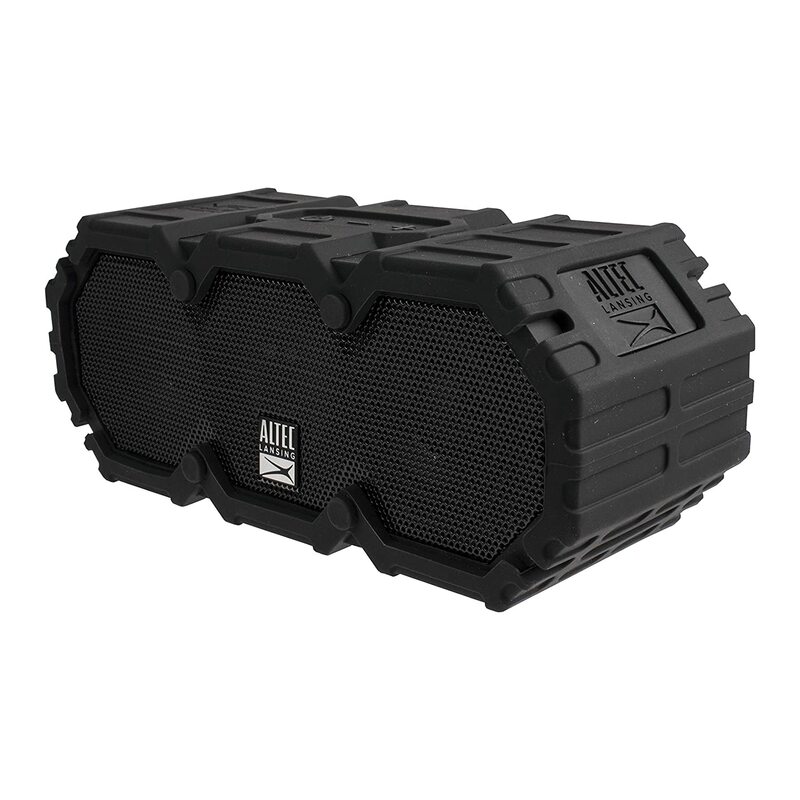 The Altec Lansing iMW577 Life Jacket 2 is one of the best waterproof Bluetooth wireless speakers if you are looking for a solution that is super resistant, resistant to water, dust, shock (rated IP67) and any other challenge that a speaker can face. Talking about the additional features you’ll get the perfect solution for what you imagine the need for a waterproof speaker can provide you. 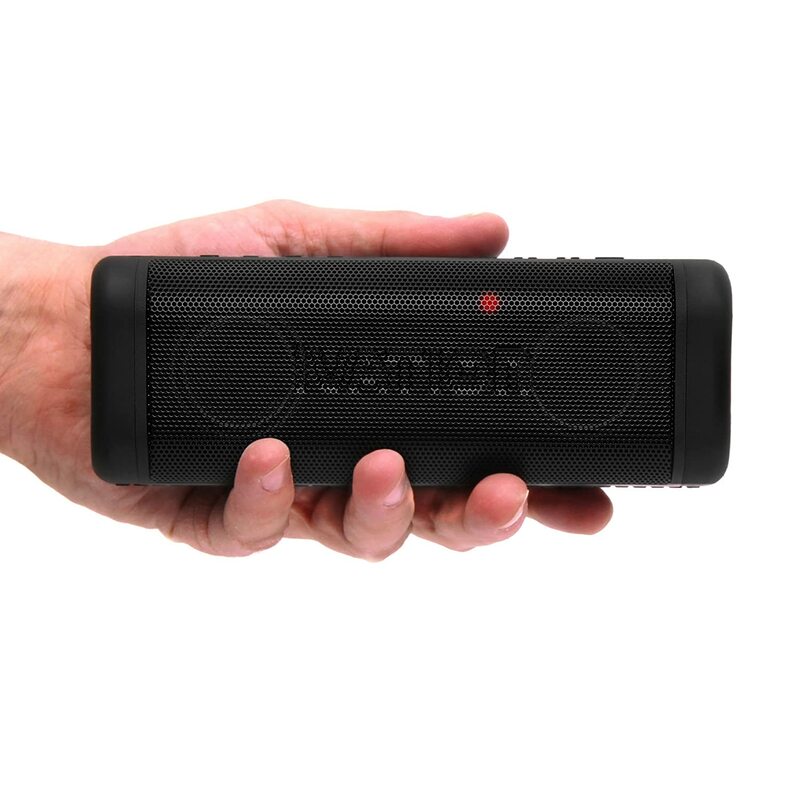 the best waterproof Bluetooth wireless speakers if you are looking for a solution that is super resistant, resistant to water, dust, shock (rated IP67) and any other challenge that a speaker can face. This is another one of the best waterproof speakers out there right now, especially if you were in need of a budget-friendly model. 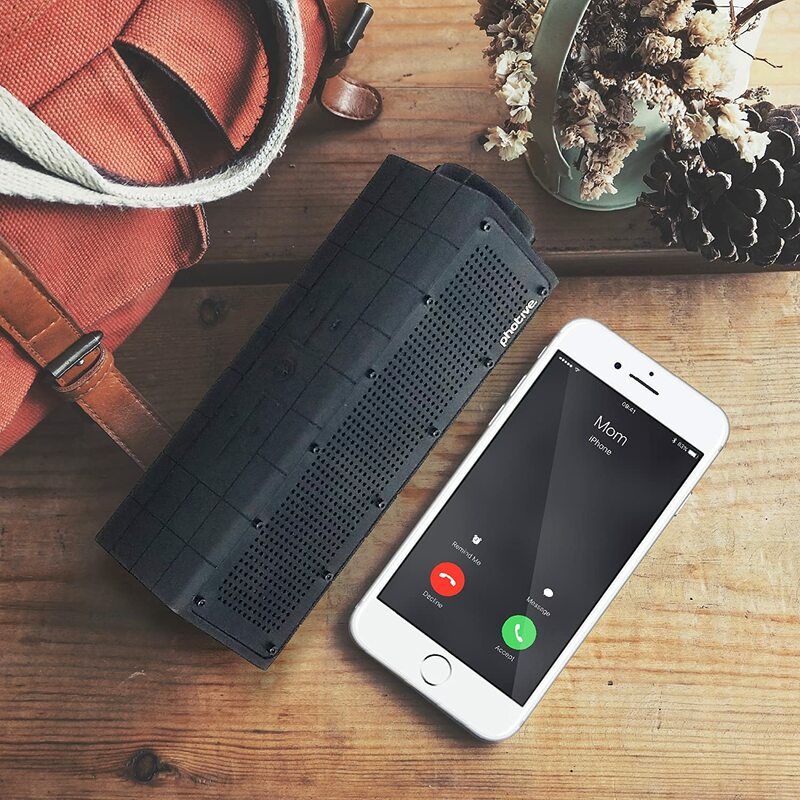 With this Bluetooth speaker, you also get protection against dust and shock (IP 66), which guarantees an overall safety and operation in most of the climatic conditions. The HYDRA frame is protected with rubber and a solid aluminum grill for a strong protection against the weather and equipped with Bluetooth 4.0 technology, this speaker will allow full functionality in all environments (at a picnic, on a beach, while hiking or camping, Etc.) while offering clear sound quality. It is equipped with 2 controllers of 40 mm and a passive subwoofer, which means that you will get loud bass along with the clear high-ends between the common frequencies of an audio player. It also has a rechargeable lithium-ion battery that will allow up to 8 hours of music without stopping, before it has to be charged again. 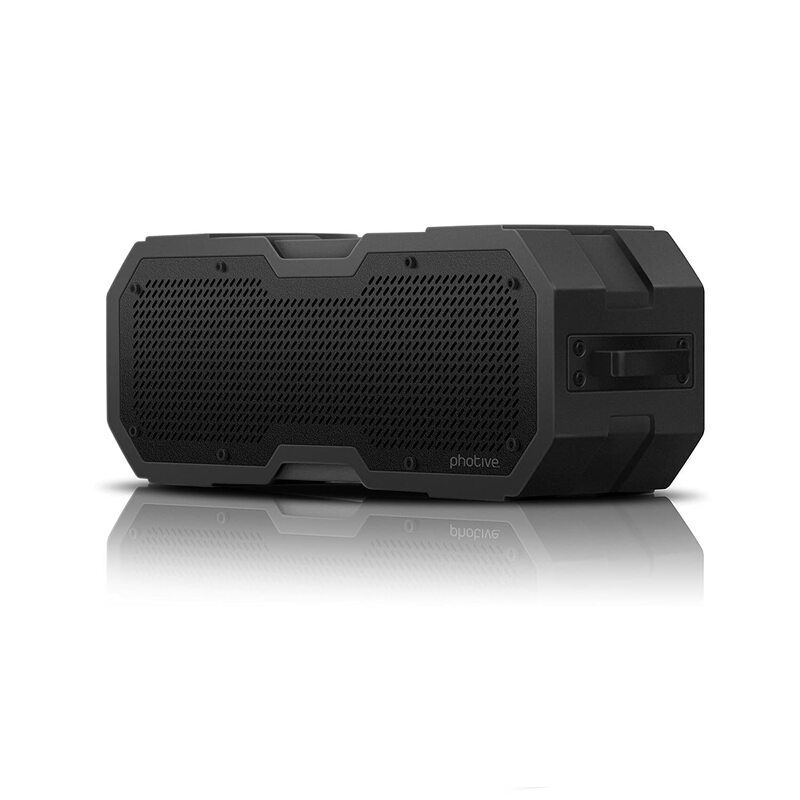 If you are looking for the best all-around and affordable waterproof Bluetooth speaker, then the Photive HYDRA should definitely be kept in mind, especially since it will be easy on your wallet, too. Here is another popular EU model to check out, and this is a step up regarding our first selection if you are looking for an above average performance waterproof Bluetooth speakers for a budget a little higher than most. 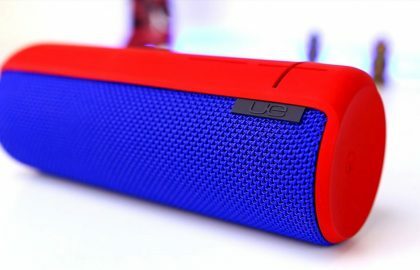 The MEGABOOM also comes up with Bluetooth and NFC connection, which puts it along products which provides you with additional protection compared to the other best Bluetooth speakers available in the market today. It is a lightweight but rugged speaker that will deliver very clear sound quality while you are out listening to music from a variety of sources, such as your smartphone, tablet or another smart device. Since it is also equipped with a passive subwoofer, the sound will have a solid bass quality for a general music listening experience. The MEGABOOM speaker is equipped with a rechargeable lithium-ion battery that allows up to 20 hours (most of here) to listen to music without stopping before the next use (the charge lasts approximately 2.5 hours). The EU MEGABOOM is also equipped with a built-in microphone, which will offer you a hands-free answering machine that will be useful if that is what you like to chat. This thing is awesome if you can afford it – you are also getting enough color options, too. The MEGABOOM speaker is equipped with a rechargeable lithium-ion battery that allows up to 20 hours (most of here) to listen to music without stopping before the next use (the charge lasts approximately 2.5 hours). The EU MEGABOOM is also equipped with a built-in microphone, which will offer you a hands-free answering machine that can come handy at times. One will also get enough color options, too, when it comes to aesthetics and attractiveness of it. 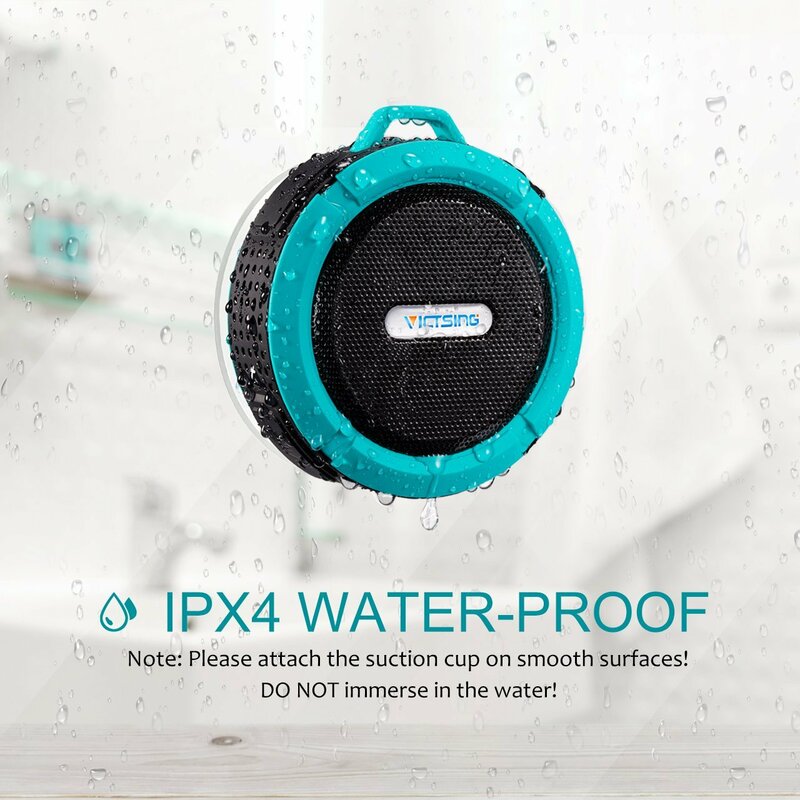 URPOWER IPX7The IPX7 is a waterproof, shock and dustproof Bluetooth speaker that will allow you to listen to your favorite music while you are out on the beach, next to the pool, camping and much more. The price-point is quite affordable and rivals much of the lowest level we will see in this guide, and if you would like a super rugged structure that you do not have to worry about falling, this is a great selection. The sound quality is complete and quite defined, and along with the clear quality also comes with some surprisingly powerful bass thanks to the built-in passive subwoofer. Equipped with Bluetooth technology and NFC 4.0, it will allow you to connect the speaker to an online music source for the proper sound quality of approximately 33 feet. By last, The URPOWER IPX7 also comes with a built-in microphone for the convenient hands-free answering of calls. It has 4 languages installed and will serve you legitimately even when totally submerged in the water. Nothing to emphasize with this model by much; However, we feel that it is great for those who wanted to save a few bucks yet to grab a sturdy waterproof Bluetooth speaker on top of it. Equipped with 4.0.Bluetooth technology, the ZS100 is a fairly cheap solution if you need an affordable, super-compact speaker for added convenience. You also have the option of NFC connectivity for all your smart devices and online sources up to 33 feet away. It has a small built-in passive subwoofer to give it some additional bass boost and with a waterproof quality that qualifies as IP67 quality, the speaker will let you listen to your favorite music while experiencing a wide variety of outdoor activities. We do not necessarily completely dump underwater or anything else, but it is covered for smaller applications near H2O. The Zettaguard ZS100 is equipped, finally with a long-lasting rechargeable battery that allows up to 12 hours of listening to music without the need to charge. Not too old for a speaker of this price and size. Here is another Photive speaker that many have highly rated. 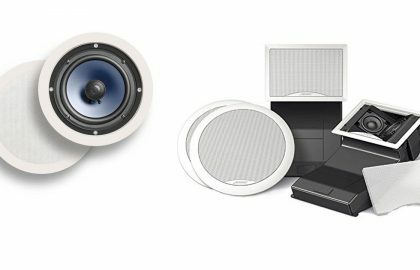 We would consider this other budget-friendly speaker since it is within the lowest price-point as opposed to many others in its class. This is ideal for many outdoor situations when you can expect moisture, water, dust, dirt, etc. because the CYREN II provides IPX 66 degree protection against all the aforementioned elements, which is a high level of resistance quite high. It comes with a rechargeable lithium-ion battery that will allow you to listen to music for up to 8 hours without stopping and is well-loved Bluetooth technology (4.0) allows you to connect conveniently. It is also said to be very resistant since it can withstand drops of up to 5 feet. The CYREN II Photive finally comes with controls directly on board, which facilitates the control and reproduction of music if you are close to it. This is one of the cheapest speaker solutions we’ve seen before. If you basically want an additional item to keep on hand and use for smaller applications, here is a “why not?” Choose the best waterproof Bluetooth speaker. It is marketed as having grade 7 water protection (we would not completely submerge it), as well as shock and dustproof, which definitely qualifies it as one of selection in this guide (even if it is the last one). It has a Bluetooth 3.0 connection and despite the size and price, you can listen to music for 6 hours without recharging. Like most others, The speaker is equipped with a rechargeable lithium-ion battery and comes with a built-in microphone for hands-free calls, which is definitely a convenient feature when you’re outside and around. With the SB517 you will also get a removable suction cup that will allow you to easily post it wherever you want (however, we do not trust it too much). 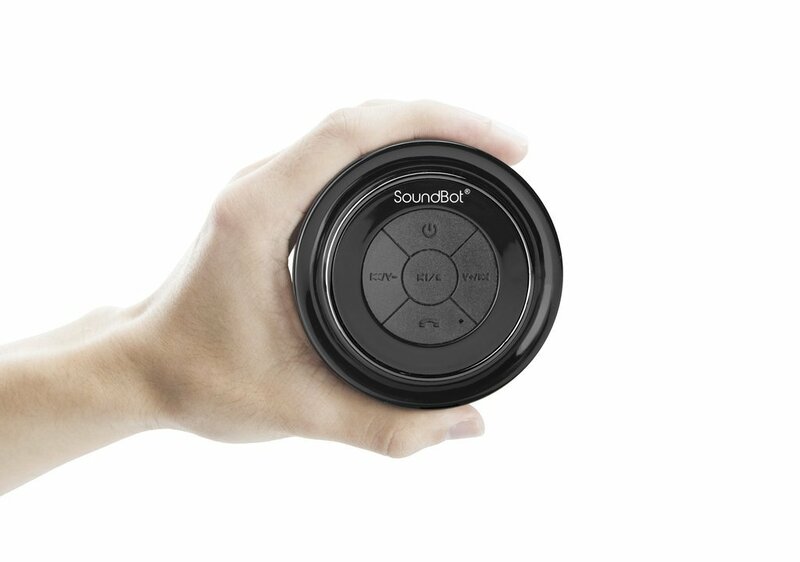 The SoundBot SB517 is an extremely inexpensive wireless speaker that will provide minimal but adequate quality for those who just wanted something simple. You also get some color options when it comes to selection. With the SB517 you will also get a removable suction cup that will allow you to easily post it wherever you want (however, we do not trust it too much). Portable speaker market is one of the few that encountered dramatic changes over these few years. We have seen drastic improvements in every possible area of a portable speaker but it does not yet stop. We have seen many waterproof speakers in the past but this one is different by the look itself. It is designed to float. It looks somewhat like a boat with two openings and all the controls in the center and two drivers on the side. You can see the volume, EQ, play/pause/speakerphone and power buttons in the center part. Nyne aqua packs four preset equalizers all of which are far different from each other which help you to choose one accordingly. There was no issue what so ever with connections and playing but the sound quality is not anywhere near the pioneers like UE, JBL, Bose or even Beats. The drivers are small which has a major impact on the audio output. The sound is thin even in higher volume. It doesn’t have that punch which is needed for a speaker. So if you want a boat like a speaker that sounds tiny but FLOATS, you can choose Nyne Aqua otherwise we have many other excellent ones on the list. 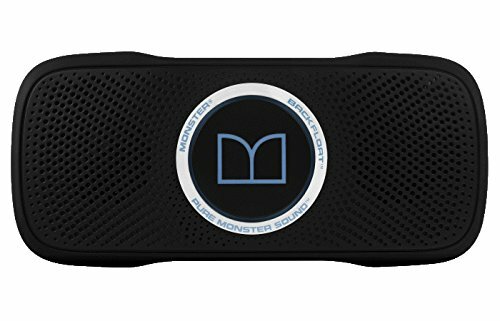 The monster Super Star Backfloat is the latest Bluetooth speaker, as the name implies, designed for use in swimming pools. The Super Star back float floats on the surface of the water and can handle the splashing. For $ 169.95, you can find more powerful Bluetooth speakers to buy, but the speakers are not likely to be pool-friendly. Measuring 7.3 x 3.3 x 1.6 inches and weighing half a pound, the back float is very portable. It has the IPX6 rating, which means that it is both the splash-proof and shockproof which means that although it can float, you cannot immerse it in water. A micro USB charging port and a 3.5mm jack is located at one side and the control buttons are located on top. The back float switches off automatically after 60 minutes idle. Performance wise, the Backfloat is delivering powerful deep bass with clear and crisp mids. 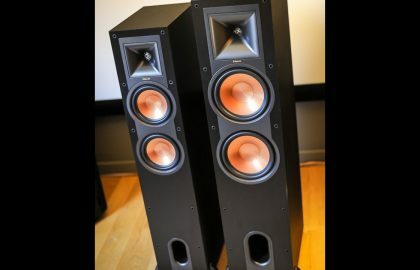 The bass is not overwhelming though, but you would not expect that a speaker of this size to sound like a subwoofer and for what it is, the back Float produces impressive lows. 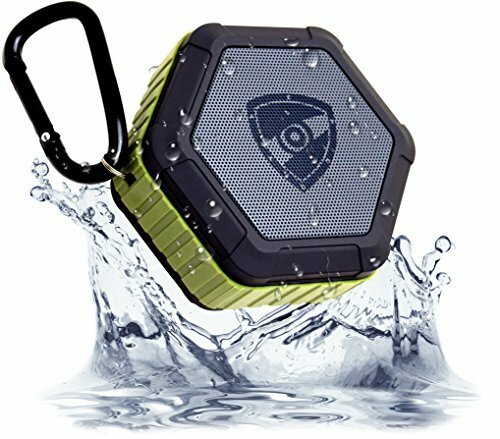 It is difficult to find a waterproof speaker with top-notch sound but the Backfloat has a balanced mix of ruggedness and audio quality. It provides audio more or less comparable with speakers those at significantly lower costs, such as the Bose Sound Link Color Bluetooth Speaker. So I must say the Backfloat is little overpriced. At $ 170, the Super Star back float is a rugged, has splash-proof design and delivers solid audio, but still, the price seems a bit out of step with the rest of the contest. But good news you can get it under $125 on Amazon. Tech fan or not, the Music Angel floating speaker is a device that certainly will attract your attention as you see it in the shops. 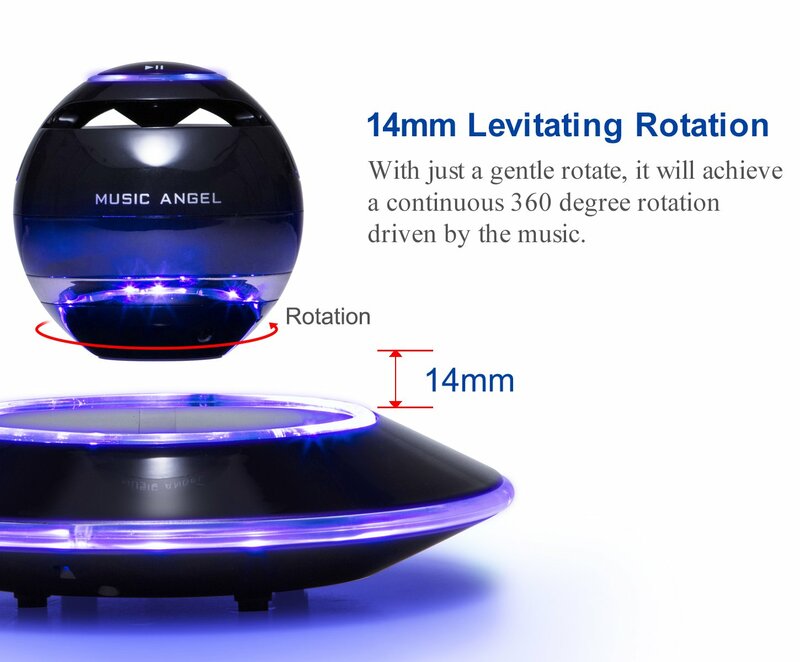 The biggest selling points of the MUSIC ANGEL Levitating Speaker are the Multi-colored LED lighting, Light Weight & Portable design and 360-degree audio capability. Equipped with a built-in subwoofer, the speaker volume is loud and clear; let it be soft music or energetic dubstep music. The installation is as easy as ABC. After fully charging the battery, all you need to do is to place the foot on a flat surface, connect via Bluetooth, and start listening to your favorite music. You can stream from almost all popular streaming services too. The 500maH battery ensures 8 hours of continuous playback. Like the Nyne Aqua, this one is also a floating speaker but has a big advantage over the former, an LCD display. You can see which track is playing, time and the display even has a caller ID. 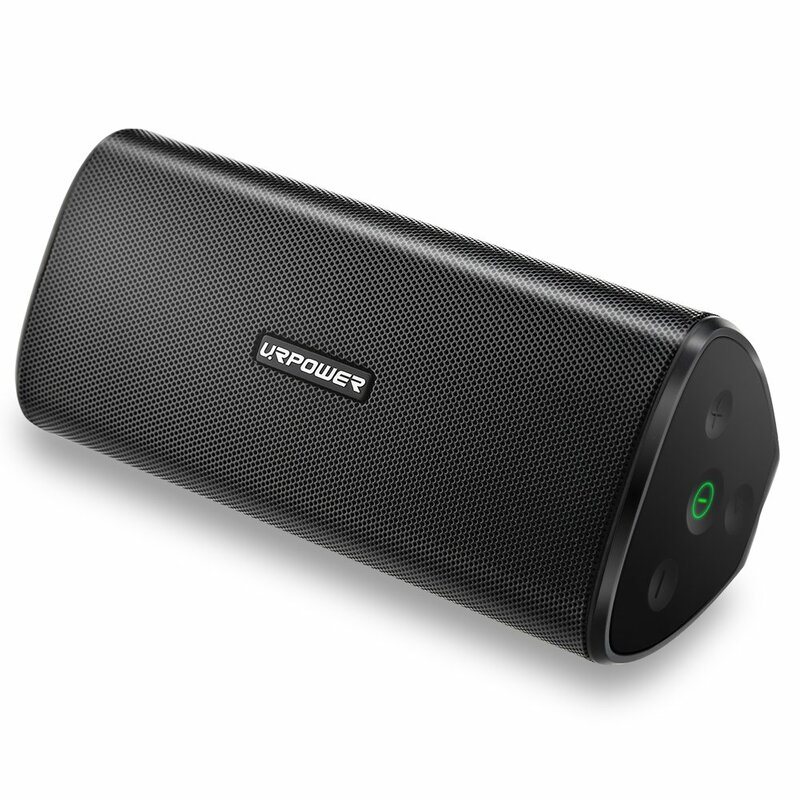 The speaker looks somewhat like Logitech Ultimate Ears, a perforated metal grille on the front and a thick rubber plug with a micro USB charging port, reset button, and aux input on the back. Ivation Acoustix BL speaker has an inbuilt clip which makes it extremely portable too. 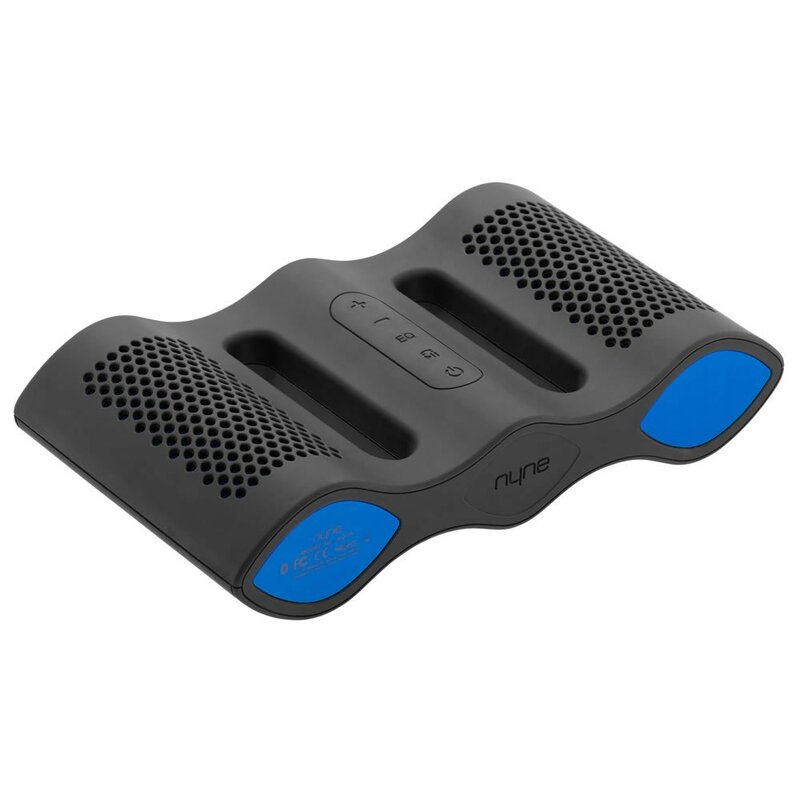 When it comes to the ‘floating’ capability Nyne Aqua is better in the design for which floats whatever happens. But waves can flip this one down easily. The Ivation Acoustix sounds better than Nyne Aqua but there is no preset EQ or even any audio adjustments either. Also, I noticed that when the speaker grille gets water inside it, it blocks the audio producing damp sound. Overall, the Ivation Acoustix is a budget solution for a floatable speaker with better sound quality than Nyne Aqua but poor usability.